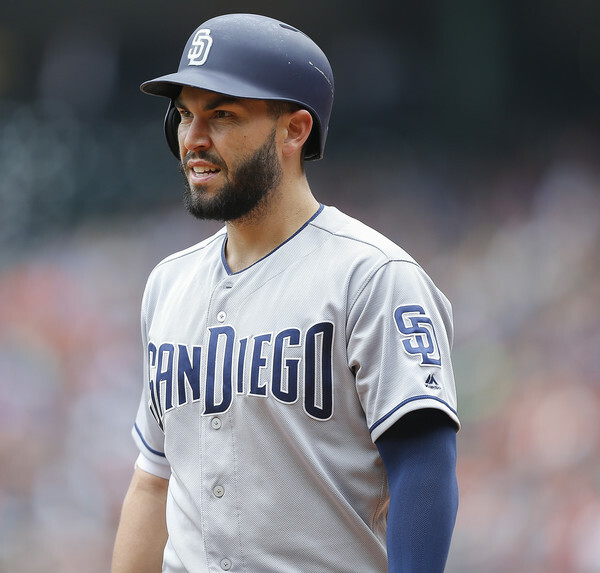 With an excess of corner outfielders on the roster who are performing offensively, is it time for the San Diego Padres to consider benching first baseman Eric Hosmer? 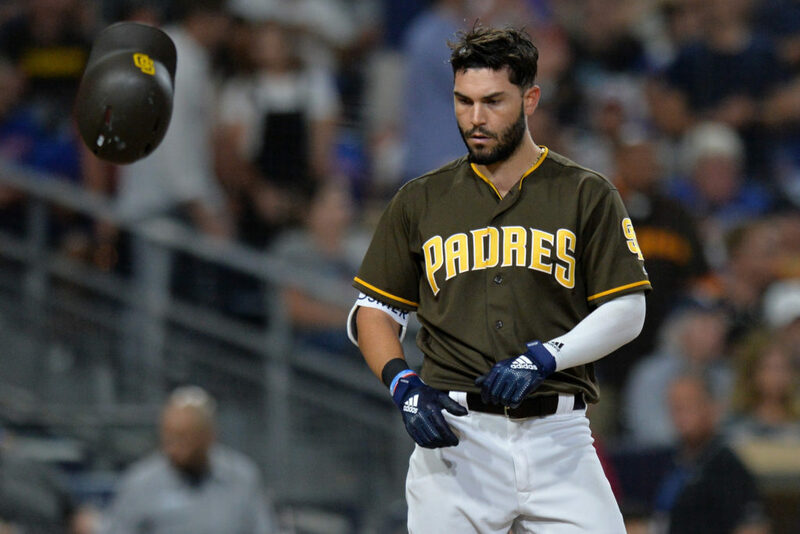 After the first two weeks of the season, several position players for the San Diego Padres are off to a good start. However, Eric Hosmer is not one of those players. At the time of his signing in 2018, Hosmer was the most notable acquisition in franchise history. He was given the most significant contract in franchise history, eight years and $144 million. He is currently in the second year of that contract and is earning $20 million. It’s still early, but he has shown a lack of production that gave Padres fans fits last season. So far in 2019, he’s hitting .203/.271/.297. His strikeout rate is high (22.9 percent). His walk percentage is low (8.6 percent). He is hitting the ball on the ground half the time (50 percent groundball rate). His wRC+ is an abysmal 51. Compare these numbers with four outfielders currently on the 25-man roster: Wil Myers, Franmil Reyes, Hunter Renfroe, and Manuel Margot. When Franchy Cordero returns from the injured list, he can be added to this discussion. Margot is off to one of the best starts in his young career. He has played the past few games in the leadoff spot and is seizing the opportunity. He also is the best defender in the outfield. Myers is back to full health and is at an expected level of production. Reyes has shown much more patience at the plate. He’s taking more pitches and is being more selective. His 11.3 percent walk rate is evidence of this. His batting average is still quite low, but BABIP has not been his friend so far (.171). Renfroe has shown improvement in the outfield. Also, he has a 126 wRC+ and gives manager Andy Green a power option to pencil into the lineup. The thing here is that these four players should be playing every day. Four outfielders and three outfield positions – the Padres have quite the predicament. Hosmer’s lack of production at first base makes it even worse. Seeing how these four players are producing and Hosmer isn’t, the question should be asked at some point if things don’t change. Should the Padres bench Eric Hosmer? Yes, he’s making $20 million and has the second biggest contract on the team. Yes, the team waited out a slow offseason to sign him to that contract. Yes, he was advertised as a player who offers “prestige value” and is the kind of veteran you want for clubhouse chemistry. Seeing how this young clubhouse has come together so quickly, you do have to ask if this would be possible without Hosmer’s leadership. 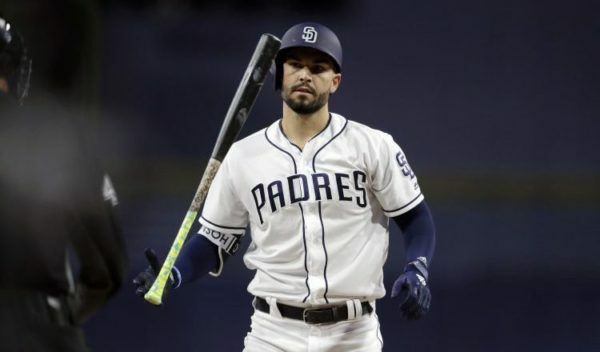 Hosmer is the biggest professional sports star in San Diego not named Manny Machado or Fernando Tatis, Jr. He was named All-Star Game MVP in 2016, a game that was played at Petco Park. Fans celebrated when he agreed to a contract with the Padres. That fanfare is beginning to fade. The numbers are falling well short of the hype. Also, this production, or lack thereof, does nothing to help the Padres win games. Winning games, after all, is the whole point of playing the sport. Taking Hosmer out of the lineup, even if only temporarily, makes room for all four of those outfielders to get the playing time they deserve. Myers was the team’s first baseman before Hosmer was signed. Even after all the moving around he has done, he would move back to a position with which he has familiarity. It’s only mid-April, and there is plenty of time for Hosmer to figure it out. He was given a free pass last season due to having to adjust to a new league. This season, seeing how he has started is leaving little room for optimism. If this keeps up, Green may have to make a tough decision and keep one of his highest-paid players on the bench. Mike is the sports editor for the Fayette Advertiser, and has been with East Village Times since 2015. His work has appeared on Bleacher Report. He is an avid Padres fan who is keeping the faith and trusting the process. A truly bad signing. Preller has been good overall, butThis one is on him. The fans of San Diego are seeing what we were beginning to see in KC. A player who is not interested in being coached and who is going to decline quickly if he does not change. It is to bad, he was a big part of our World Series teams, but the leagues have figured out how to get him out. A breaking ball down and away will produce a swing and miss or a weak ground ball to a middle infielder. It is to bad, he could have been one of the greats of the game. As a Royals fan, Hosmer will always hold a special place in my heart. But, he was part of a perfect storm for us. Hosmer is an average ballplayer at best. Look at the back of his baseball card. He has been doing this his whole career. This shouldn’t be a surprise for anyone. The biggest mistake the Royals made is not trading him right after the 2016 All-Star game. We could have really taken advantage of some team. I’ve been saying this since last year. Padres would be a better hitting team without Hosmer in the lineup. Myers or Reyes at first would be a much better bat than Hosmer. Yes, but does Preller and Green have the wherewithal to make a change? They could start by sitting him for a few games, and/or batting him 7th/8th/9th. In addition to one or more very qualified players on the current roster (Myers), there are at least FOUR good-to-very-good options in AAA. Pirela, Naylor, France, and Dickerson would all be a significant upgrade. It’s time for some tough love with Hosmer. Yes he should be benched. But someone needs to wake up Andy Green on this. He has given the most at bats to his worst hitter. This is major league stupidity on Green’s part. One of the reasons KC did not even make an offer to Hosmer was he was regarded as uncoachable when it came to his swing. Last year was brutal, this year (although it’s very early) is even worse. At some point someone has to sit down with the player and tell him he’s hurting the team and needs to change his swing. If he won’t, you have to restrict his playing time. He’s been horrible against LHP, so that is where to start. Platoon him. And when he does play, bat him 8th like he deserves. His absurd contract, NTC and all, makes him untradeable regardless of how much of his salary you pay. I literally wrote this this morning. Wil Myers is hitting. Also, it’s not like Eric Hosmer is saving game at first. Wil isn’t horrible at first either, his bat is needed. One of the few hitting consistently. I understand giving veterans some leeway, and I agree with this to some extent, but at this point he should sit against lefties and, at best, bat 8th against righties. He is just not that good. Can we at least admit that? And unless he turns things around, he should rarely play. He has had years to improve on his grotesque pound-the-ball-into-the-ground swing, and he either won’t, or can’t. Either way is really, really bad. The only reason he starts… or, perhaps, 97.6% of the reason he plays, is because he is massively overpaid. That is just D – U – M (dumb). If the Padres truly want to win they would at least send him a message by sitting him right now. Yes!!!! Bench him! It is early, but we have last year as well to measure him by. Admit the bungling stupidity of signing him, and move on. All things considered, a team that wants to win will play its best players. Hosmer is NOT in that category.